The trucks, truckers, and techniques to get your goods to their destination over any distance. 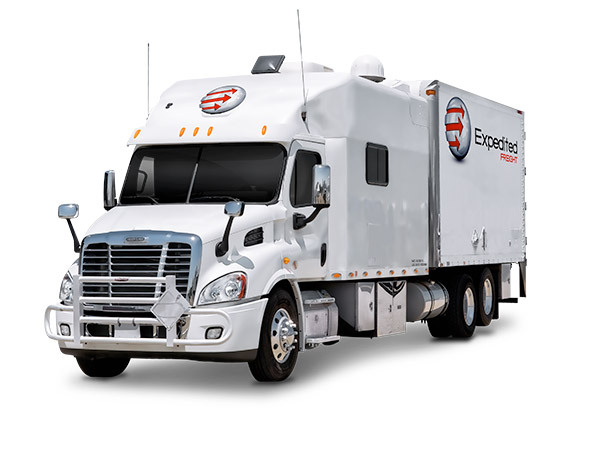 In providing expedited freight services, ExpediteTransportation.com takes care to promote quality in every aspect of your delivery. We invest in only the most reliable trucks and vans, and provide regular maintenance to keep them running smoothly. We then combine these vehicles with a team of skilled drivers and a savvy shipping plan. Thanks to these precautions, our team never struggles to complete your orders on or ahead of schedule. Reliable Vehicles - Not only do expedited freight firms need to have large numbers of vehicles, but they have to keep those vehicles in good condition at all times. They must also station such trucks in convenient locations so that they can get to their clients and then to the destination without any lead time. Skilled Drivers - Even the most advanced trucks are only as good as the people driving them, which is why expedited carriers have to vet their employees carefully. Only truckers with full training, clean backgrounds, and commitments to courtesy will be able to complete swift shipments safely. Centralized Organization - No matter how many vehicles and drivers an express shipping company has, it must be able to tie them all together. By planning and coordinating deliveries from a centralized office, they can see the big picture and eliminate any inefficiencies. ExpediteTransportation.com fulfills all of these requirements with flying colors. Regardless of your location or specific needs, we will never lack the vehicles, planning, or drivers to serve you effectively. Consistent Contact- We have a centralized customer support office, where you can get answers and updates at any time. Swift Services- We offer both emergency and scheduled trucking services at high speeds whenever you need them. Prudent Pricing- Our clients receive a range of cost options, allowing them to easily work our services into their budgets. Comprehensive Coverage- We have thousands of vehicles on alert in key locations across the United States and Canada. In order to minimize the cost of our delivery services, we maintain vehicles in a range of sizes and carrying capacities. This means there will be little empty space on the truck, allowing you to pay only for the room you use. Our vehicles include cargo vans, which can hold between 2,000 and 3,000 pounds of cargo, as well as straight trucks with the capacity to carry up to 12,500 pounds. For the largest orders, we can assign you a tractor trailer, which holds as much as 44,000 pounds of shipping goods in a secure payload. For more information on express shipping on the ground as well as by air, contact ExpediteTransportation.com at (800) 713-1000.